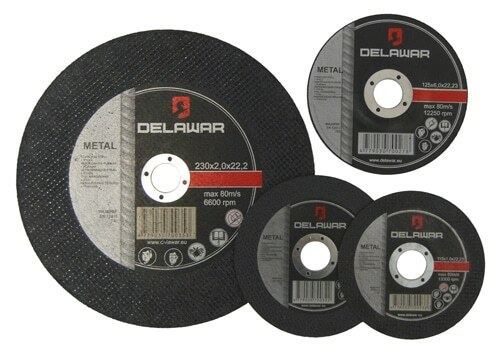 Metal cutting and grinding discs DELAWAR are made from high quality abrasive and binder material. 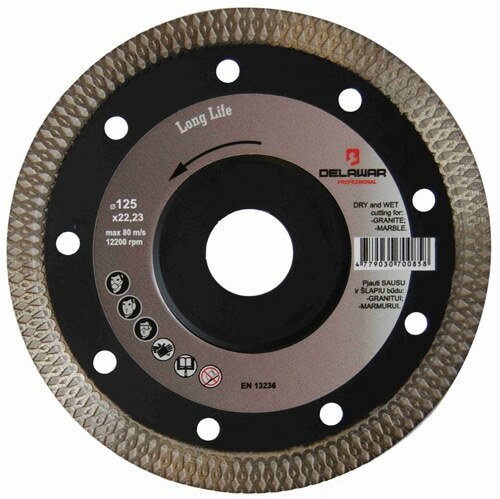 Therefore discs cuts/sands quickly and easily. 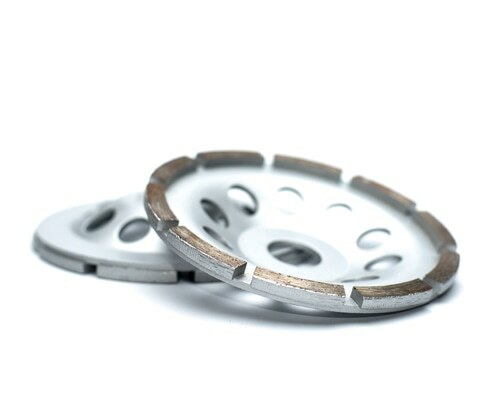 Universal diamond discs for concrete cutting DELAWAR SEGMENT are made from high quality PREMIUM segment, which allows cutting efficiency and lightness. Can be used for dry and wet cutting. Diamond sanding plates DELAWAR are made from high quality PREMIUM segment. Can be used for sanding of various concrete or stone surfaces. 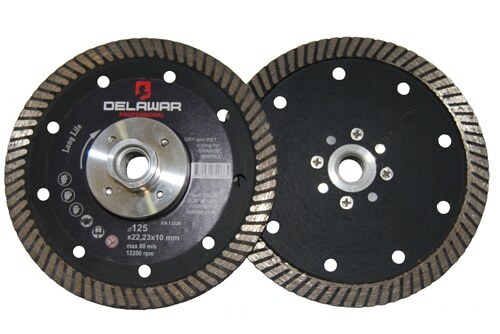 The thickness of high quality diamond blade DELAWAR with X-TURBO segment is 1.2 mm. 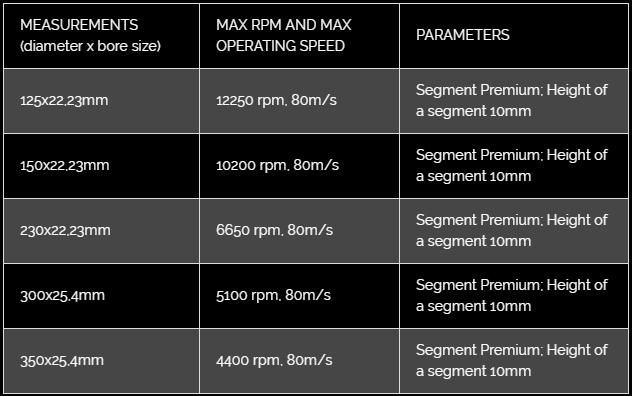 It allows to cut in very high RPM. The blade cuts easily and almost doesn’t divide the material, therefore it is valued among professionals. Excellently cuts the tiles, also suitable for dry and wet cutting of hard materials such as marble, granite. 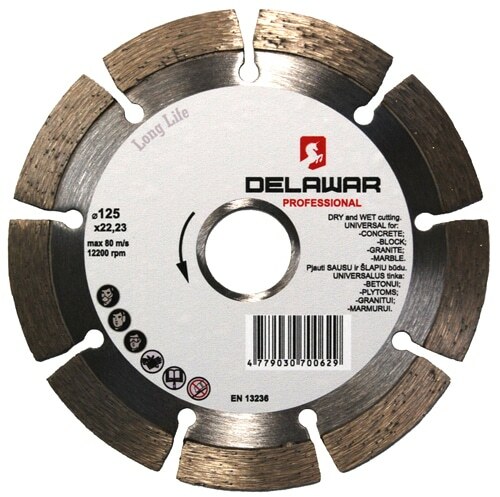 Diamond blades DELAWAR TURBO M14 are made from high quality TURBO PREMIUM segment. The blade is suitable for wet and dry cutting of hard materials such as marble, granite. 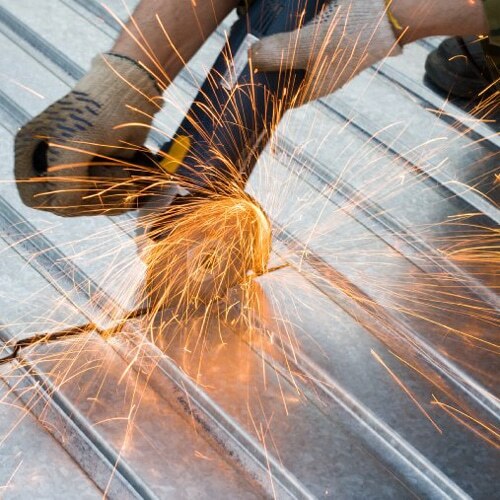 The blade has M14 thread, therefore it can be added to angle grinder without additional tightening nuts. The blades allows to cut close to the intersections of surfaces (eg. : floor near the wall and so on). DELAWAR core bits are made from high quality PREMIUM segment. 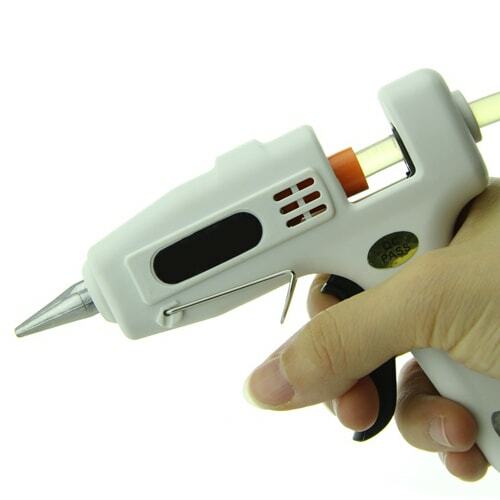 Used for electrical wiring or other holes drilling in concrete walls or building blocks. 65x62mm Segment Premium; Height of a segment 9mm; Thread M16. 82x62mm Segment Premium; Height of a segment 9mm; Thread M16. 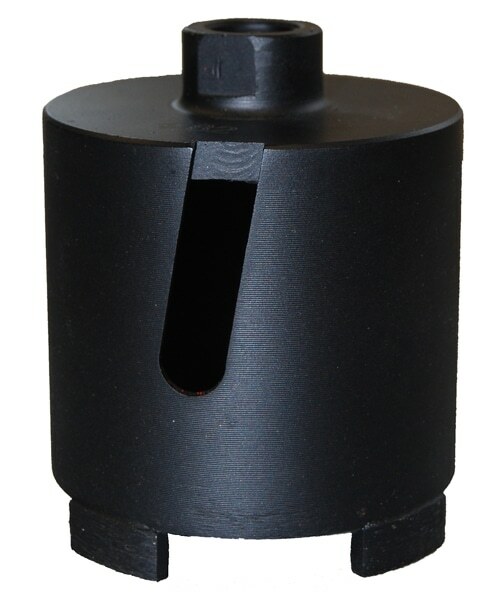 DELAWAR core bit adapters are available in two types: SDS (10x115mm) for the puncher and HEX (12x88mm) for the drill. 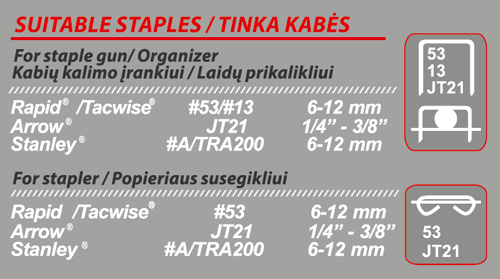 With these adapters we recommend to use tapered DELAWAR drills (8x120mm). 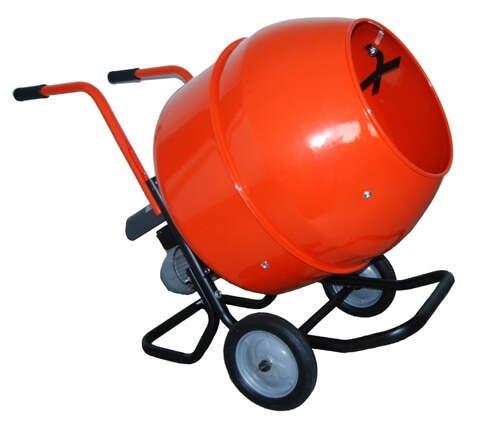 Concrete mixers DELAWAR for amateur and semi professional usage. High quality metal, solid design, metal gears and reliable engine ensures smooth operation and durability of the mixers. CAPACITY: Due to the high capacity of the drum mixing time is shorter. 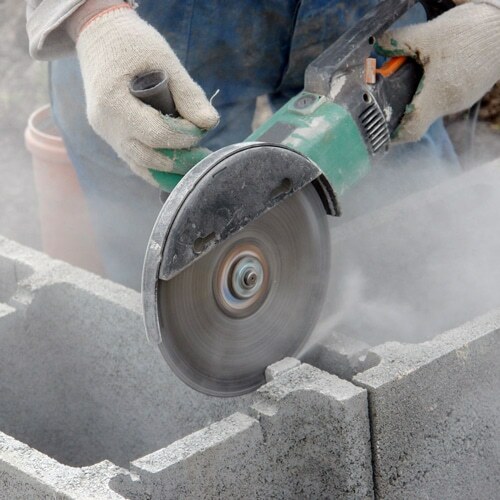 Design of the mixing blade ensures that concrete is thoroughly mixed. COMFORT: Round 16-positions adjustment knob and foot lock facilitates the work. 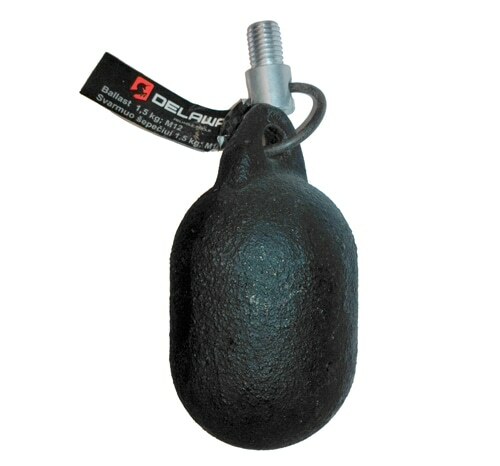 RESISTANCE: Thick mixers axle with two load-bearing resistant to withstand the heavy workload. -Motor windings are made from copper. Relative electrical conductivity and mechanical strength of windings is higher than aluminum. 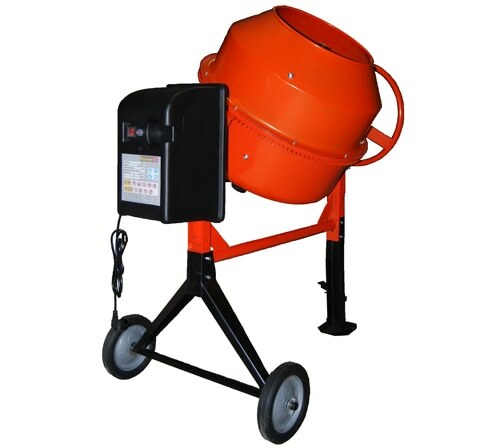 Concrete mixers DELAWAR COMPACT for amateur and semi professional usage. High quality metal and solid construction ensures durability. Torsion is transmitted to reduction gear, and direct engine gear increases reliability of the mixer. 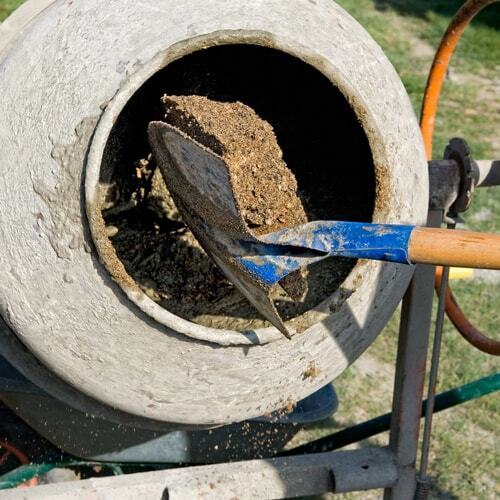 The mixers of this model are mobile - after finishing mixing, concrete can be transported and poured out where needed. 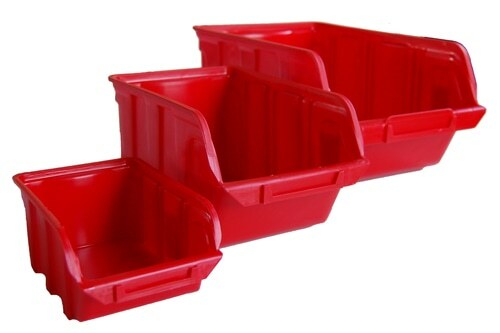 Storage boxes DELAWAR are made of high quality plastic. They are comfortable and have a strong closing mechanisms. 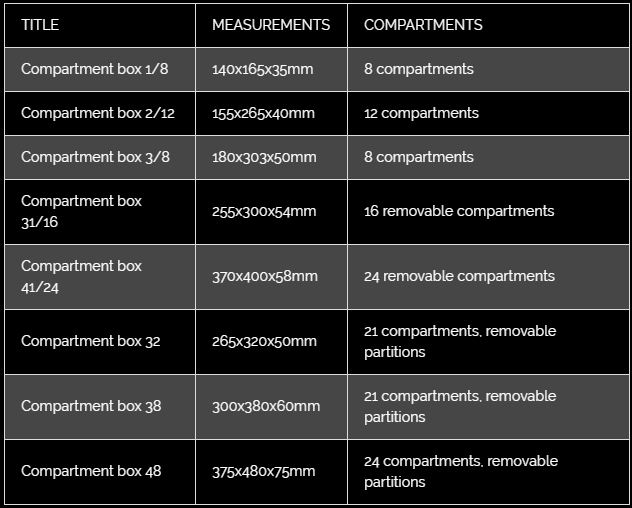 The range consists of several models: with conventional compartments, with removable compartments, and with removable partitions. 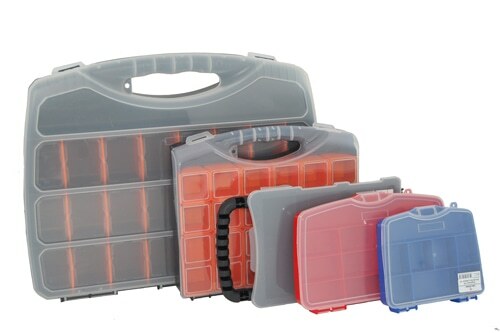 Storage boxes DELAWAR are available in 3 sizes, made from high quality plastic and are suitable for storing and exhibiting. 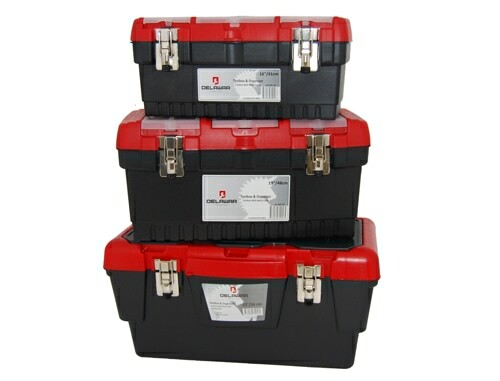 DELAWAR tool boxes are made of high quality plastic. They have a solid handle, metal closing mechanisms, removable inner part and three separate sections on the lid for small items. 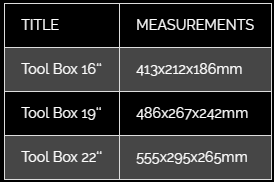 The range of DELAWAR tool boxes consists of 3 sizes: 16‘‘, 19‘‘ and 22‘‘. 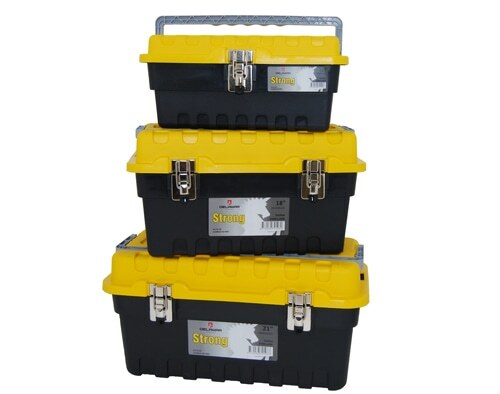 Tool boxes DELAWAR STRONG are made from high quality plastic are extremely durable and comfortable to use. They have a solid handle, metal closing mechanisms and removable inner part. 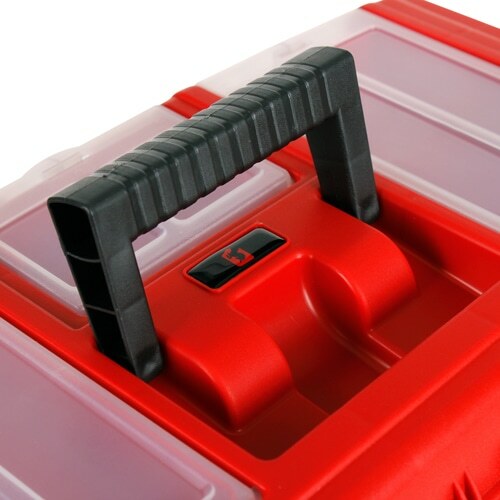 “Auto lock” function allows to carry tool boxes without closing its metal closing mechanism. These boxes can withstand shock and weight. 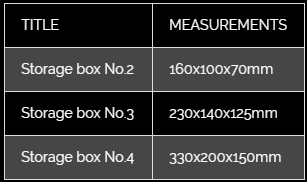 The range of DELAWAR STRONG tool boxes consists of 3 sizes: 16‘‘, 18‘‘ and 21‘‘. 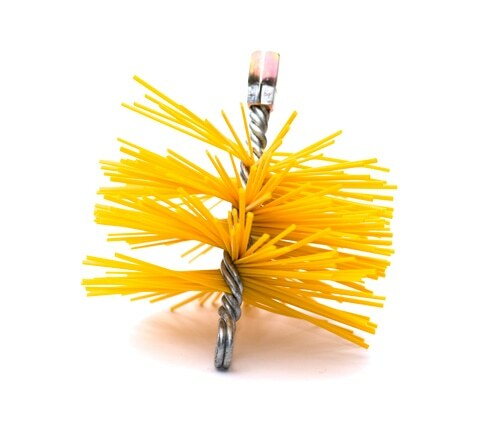 A wide range of thin wire chimney brushes DELAWAR is ideal for solid fuel boilers and chimneys cleaning. Tick bristles crown allows to clean different diameter holes. 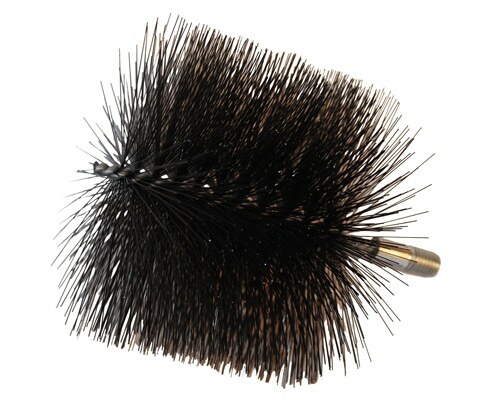 Brush D30 Round thin wire brush; D-30mm; L-100mm; Connecting thread - M12. Brush D40 Round thin wire brush; D-40mm; L-100mm; Connecting thread - M12. Brush D50 Round thin wire brush; D-50mm; L-100mm; Connecting thread - M12. Brush D60 Round thin wire brush; D-60mm; L-100mm; Connecting thread - M12. Brush D80 Round thin wire brush; D-80mm; L-100mm; Connecting thread - M12. Brush D100 Round thin wire brush; D-100mm; L-100mm; Connecting thread - M12. Brush D130 Round thin wire brush; D-130mm; L-100mm; Connecting thread - M12. Brush 30x80 Rectangular thin wire brush; 30x80mm; L-100mm; Connecting thread - M12. High quality flat wire chimney brushes DELAWAR have three windings. Stiff bristles form dense crown, therefore chimneys are cleaned very well and brushes lasts for very long time. 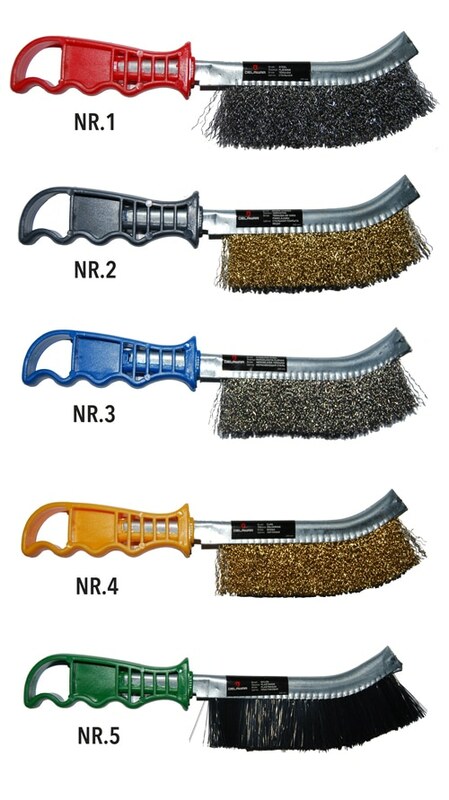 Our range offers various size brushes for cleaning square or round openings. 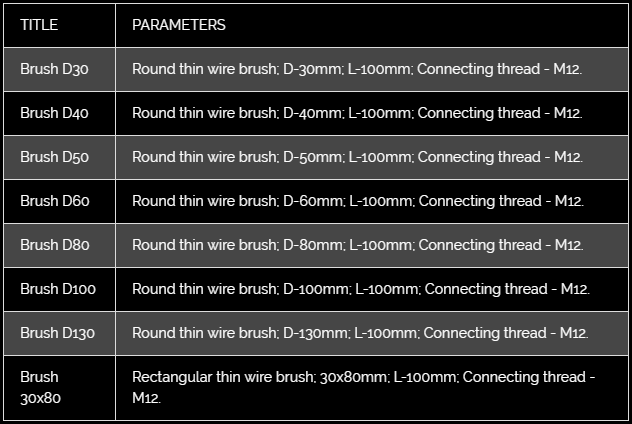 Brush D150 Round flat wire brush; D-150mm; 3 windings; Connecting thread - M12. Brush D200 Round flat wire brush; D-200mm; 3 windings; Connecting thread - M12. Brush D250 Round flat wire brush; D-250mm; 3 windings; Connecting thread - M12. Brush 200x200 Square flat wire brush; 200x200mm; 3 windings; Connecting thread - M12. Brush 250x250 Square flat wire brush; 250x250mm; 3 windings; Connecting thread - M12. Plastic bristle brushes DELAWAR do not damage mechanically ceramic or stainless steel surfaces. 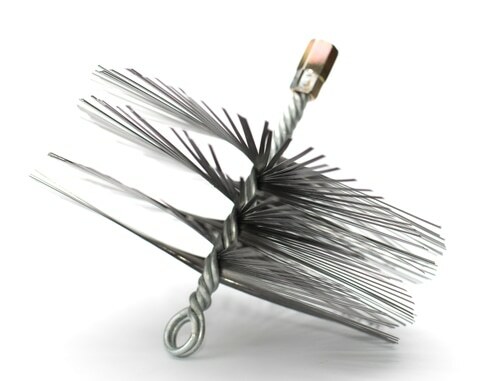 Three windings brush bristles form dense crown, therefore chimneys are cleaned well and fast. Also these brushes can be used for cleaning the air inlet openings. The range consists of two brushes. Brush D150PP Round plastic bristle brush; D-150mm; 3 windings; Connecting thread - M12. Brush D200PP Round plastic bristle brush; D-200mm; 3 windings; Connecting thread - M12. 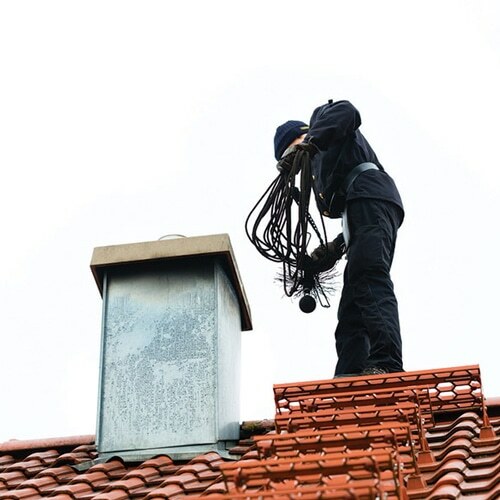 Flexible chimney cleaning rods DELAWAR can be used for cleaning from the top (from the roof) and from the bottom (from inside of the house) this makes cleaning process much easier. DELAWAR range includes two types of rods, plastic and fiberglass. Plastic rods PP1000 L-1000mm; Connecting thread - M12. Plastic rods PP1400 L-1400mm; Connecting thread - M12. Fiberglass rods FG1500 L-1500mm; Connecting thread - M12. Solid 4 windings brush strings are used for cleaning from the top. Brush string L3000 L-3000mm; Connecting thread - M12. Brush string L5000 L-5000mm; Connecting thread - M12. 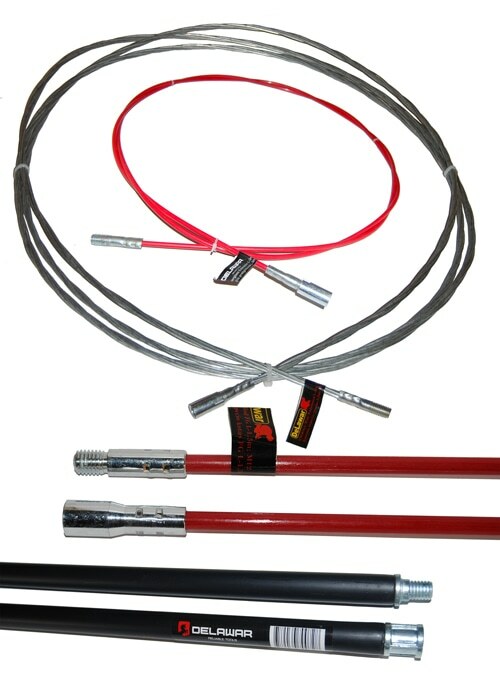 Fiberglass extension rods are more flexible and lighter than the brush strings. Suitable for chimney cleaning from the top. Extension rod FG L3000 L-3000mm; Connecting thread - M12. Extension rod FG L5000 L-5000mm; Connecting thread - M12. Metal weight DELAWAR is connected to brush using thread – it facilitates and speeds up chimney cleaning process. Weight 1,5kg Weight- 1,5kg; Connecting thread - M12. 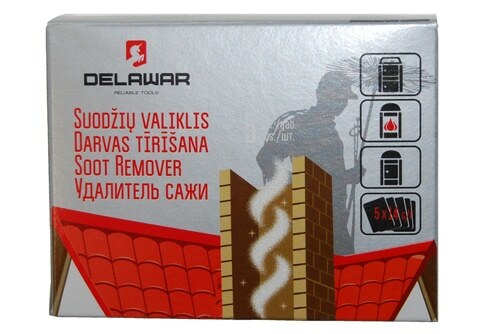 Chimney soot remover DELAWAR – simple, fast and non-toxic way to clean and keep the chimney cleaned. using these fine granules, soots are dried in low temperature and without flame. When chimney is clean it is recommended to use remover for preventative care (one box last for up to 3 months), in this case you will retain maximum heating efficiency of furnaces, boilers and fireplaces. During heating period use for approximately 14 days. Each carton contains 5 bags of 14 grams. Unpacked bags are thrown onto burning coales or firewood. 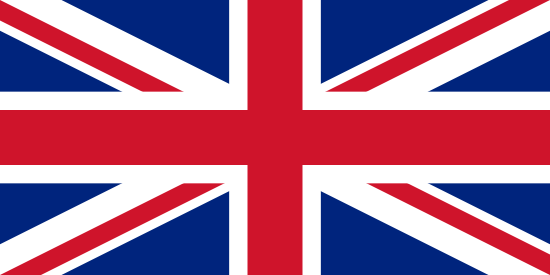 Granules are manufactured in EU, in compliance with all quality and safety requirements. Recommended for use in combination with other DELAWAR chimney cleaning products, by using products combo you will reduce creosote disruption to your heating system and prolong durability of boiler and chimney. 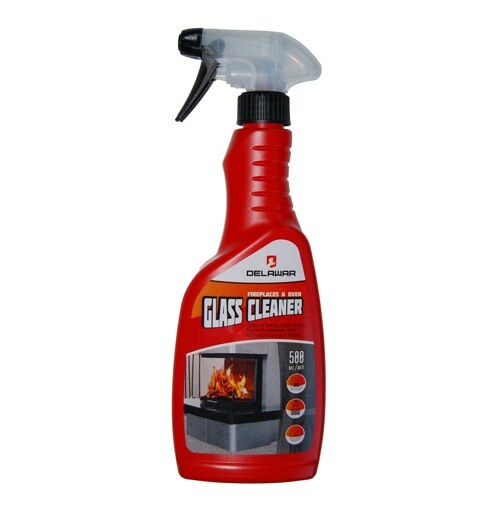 DELAWAR GLASS CLEANER, is a highly effective agent for cleaning and degreasing of fireplaces, ovens and stoves. It delicately degreases, removes burnt remains, smoke and soot deposits, dust and other impurities. The product does not damage the surface of metal or glass parts. 1 Steel The easiest and cheapest option, for those who sands often. 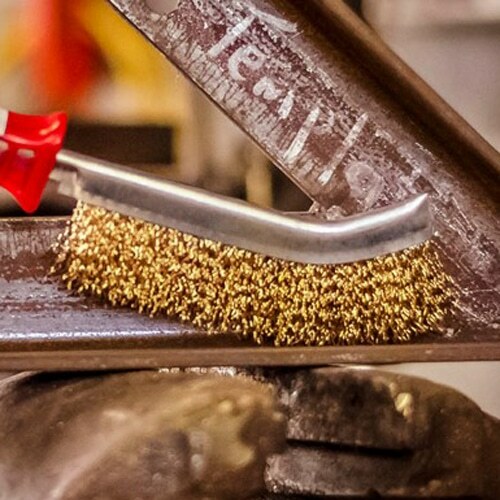 2 Copper coated Steel brush, coated in copper, which increase resistance of corrosion. 3 Stainless steel Stainless steel wire brush is suitable for sanding various stainless steel surfaces. Steel brushes are not suitable for such surfaces because it can scratch the surface and this could cause rusting. 4 Brass Brass wire - durable and have harder abrasion, these brushes - the perfect choice for those who want to have a durable tool. 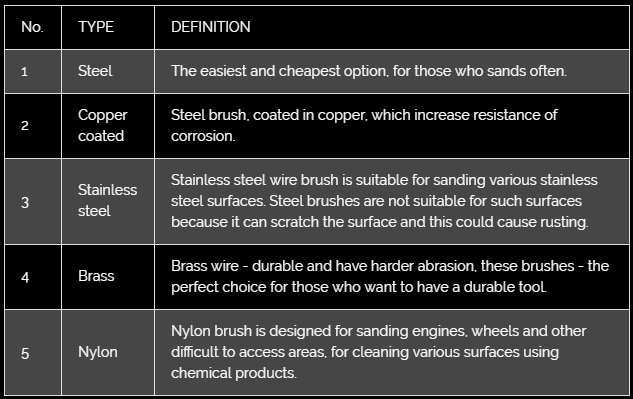 5 Nylon Nylon brush is designed for sanding engines, wheels and other difficult to access areas, for cleaning various surfaces using chemical products. 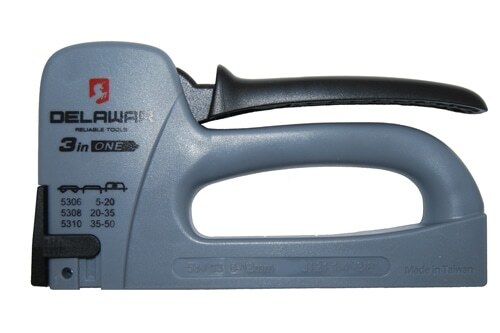 This reliable three functional staple gun DELAWAR knocks staples in high quality, firmly staples up 50 pieces of paper, doesn’t damage wire, nails it to desired surface. Excellent choice for various household chores and repairs. 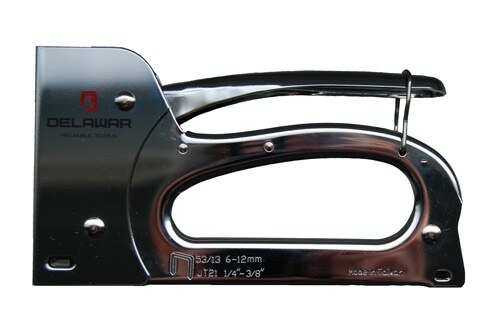 Industrial heavy stapler DELAWAR is ideal for home decoration, for production or restoration of soft furniture, for decorative work, for fast fabric or posters mounting and various other amateur or professional usage. Strong steel construction ensures the quality of forging and longevity of tool. Glue sticks DELAWAR are suitable for all 11mm diameter glue guns. Glues can be used in household, floristics, small car body repairs and similar applications. DELAWAR range includes several types of glue sticks that are classified by fields of usage.